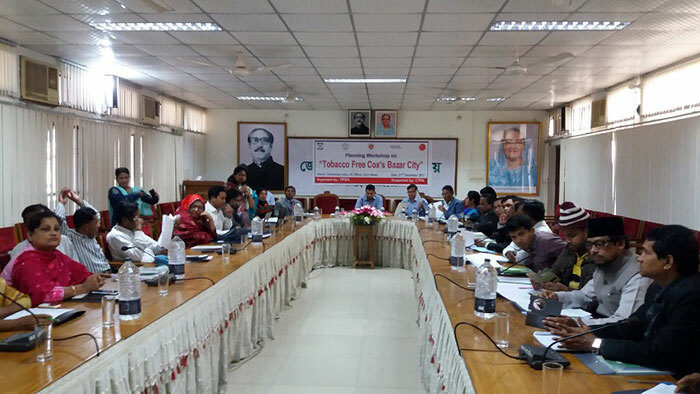 With the aim to develop a tobacco free model city in Cox’s Bazar, a planning workshop on “Tobacco Free Cox’s Bazar City” was organized on 21st December 2017 at Conference room of DC office in Cox’s Bazar. The workshop was organized by YPSA jointly with DC office and Cox’s Bazar Municipality with the support of Campaign for Tobacco Free kids. Mr. Mohammad Mahidur Rahman, ADC (General), Cox’s Bazar was the chief guest. Besides Mr. A.K.M. Shahriar, Deputy Director, Agriculture Department, Dr. Bidhan Paul, Vice president of BMA, Mr. Sariful Alam, Lead consultant of CTFK, Dr. Mahfuzur Bhuiyan, Grants Manager of CTFK and Palash Chowdhury, Director (Finance) of YPSA were present as guest. Representatives from Cox’s Bazar municipality, different government departments, Upazilla Parisad, business community, journalist, NGOs and civil society were participated in the workshop. The key note paper on Tobacco Free Cox’s Bazar city was presented by Ms. Nasim Banu Shyamali, Team Leader, Tobacco Control project, YPSA. 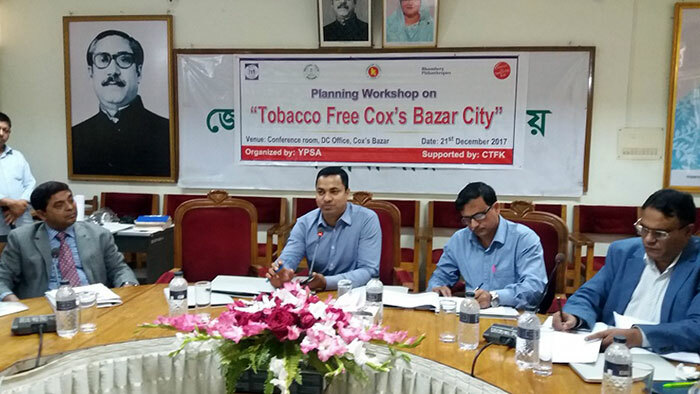 All the participants endorsed the slogan of the Tobacco Free Cox’s Bazar city initiative “Tobacco Free Cox’s Bazar-It’s our commitment”. They commit to work together and provided many suggestions and recommendation for implementing the tobacco free initiative.